In the Joomla! Community there is a constant and urgent need for capable designers that can contribute their creativity and colourful skills to create beautiful artwork. If you are a talented designer with passion for Joomla! and good design, this is a great opportunity you shouldn’t miss! The Joomla! Shop is going for a general revamp and this is a great opportunity for any designer out there to get on board and help us to redesign all the Joomla! items and shirts. After some major internal changes, the Joomla! Shop is almost ready for a re-launch. The shop has been for many Joomla! people and event organizers a place where they can buy official Joomla! t-shirts or hats. It is an indispensable spot to keep alive not only the spirit of the community, but also the visibility of the brand. 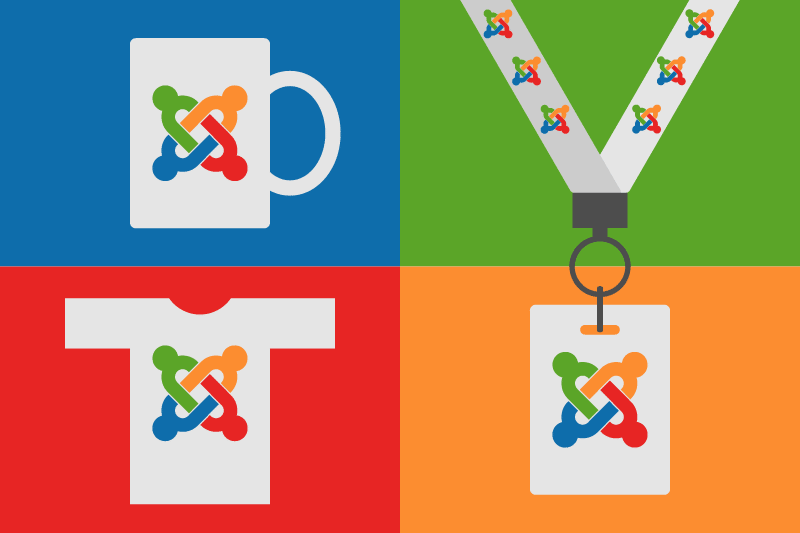 The call is open to every designer and creative mind out there that knows what Joomla! is and love to transform this passion into a meaningful, beautiful and effective message that everybody can wear! If you don’t, this is a good chance to get on board in a fun and original way. As a designer we ask you to express your creativity. We are looking for great, creative artwork that may be printed on t-shirts but also on caps, mugs, lanyards and many other objects available in our shop. Designers need to consider scale, legibility, surface, colours. We also want you to think about the durability of the items itself: “We all know that merchandise have a short life: you use them for a specific event and then don’t wear them anymore, maybe only to stay comfortable at home or to show them at the next Joomla! event. We want to change this concept by creating new items that people feel comfortable to wear in their everyday life, at work as well as at home, to give as a gift or as a part of their everyday objects. Being part of the Joomla! community is something to be proud of so why are you waiting the next event to spread your passion for it?! ” says Chiara Aliotta, former Joomla! Brand manager. As a creative we also ask you to properly communicate the Joomla! brand message, creating a consistent and meaningful artwork that respects the Joomla! signature and the diversity of the community (in terms of language and culture background). Does it sound challenging enough for you? Let's start and get involved! 1. Download the designer kit. We have prepared for you a .zip file to get started with. It contains the official Joomla! signature, the Joomla! Brandmark, some official typefaces and the official Joomla! colour palette, and finally a spreadsheet indicating the available items and their available printable area. Don’t feel limited to these elements: you can add new colours to the swatches, you can use different fonts from the one suggested, you can create graphic elements, effects, shapes and whatever inspires you in order to communicate the Joomla! spirit. The only note is about the Jooma! signature: we ask you not to change it in a dramatic way that may compromise recognizability and legibility of the logo itself. To sum up: you should create an original and exclusive design but still be able to recognize that you are communicating the Joomla! essence with it! Due the volume of ideas we hope to receive we recommend to send good quality of images that don’t exceed the 1MB. You can also send us some rendering on items to better communicate your idea to us. Don’t forget to add a few lines to tell us about your concept and your contact details in case your design is selected. 3. Send us your final artwork. If your ideas have been approved by our Committee, we will contact you by email and ask you to prepare the final artwork that we will use to print the graphic on our items. If your idea is extremely “out of the box”, we may also ask you to adapt your design to further items and create a special series dedicated to it. As you can see possibilities to express your creativity never ending! Are you feeling excited already? Grab the media kit and start to design now!